MH Travel has created this tour especially for the guests who stay in Kotor and in Kotor Bay. This is a budget tour where the guests who prefer to spend the holiday in Kotor want to visit and explore the most popular tourist destination on the Montenegrin coast. Budva is completely different than Kotor and attracts guests who want to spend their vacation mostly on the beach and enjoy the good night life. Budva has a nickname "Queen of the Mediterranean" and no other city on the Adriatic coast has developed as fast as Budva. Despite the urban chaos and brand new buildings, apartments and hotels, Budva always finds a way for guests to have a good time. Maybe it is because of so many offers, so many beaches, activities, restaurants, shops, pubs, clubs, open air discotheques and thousands of guests on promenade every day and night. You can spend the summer with low budget or high budget, Budva caters for everyone. This makes this city very unique. In last 20 years, Budva became recognized as the party town, and is attracting youth from all over the world. This is the city with the biggest open air discotheque in Montenegro named Top Hill, this is also the city where the biggest world famous rock, and pop starts had concerts like Rolling Stones and Madonna. This is the city where all of the best DJs in the world have had sets. Budva has the biggest Aqua Park, numerous beaches in 122 square kilometers of surface, and of course Sea Dance Exit Festival. We decided to offer the guests a tour where they can see Budva and St. Stefan without any rush and spend time on some of Budva's beaches if they want so. The tour starts from Kotor and we go to the old town of Budva where the guests will get the city tour and be introduced with its 2500 year old history. Guest will also be informed about the main spots as well as the beaches next to the town. Old town in Budva is surrounded by beaches: Mogren, Pizana and Richard's beach. 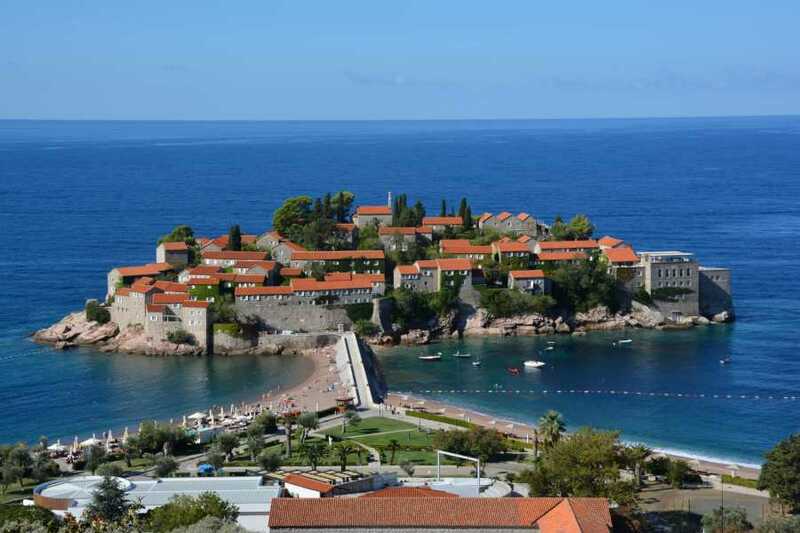 After visiting Budva's old town zone, we will go to St. Stefan, the most beautiful place on the Montenegrin coast. We should be there up to 11:00 where the guests will be offered to take tour of the island of 45 minutes. The guided tour is organized by hotel resort St.Stefan and costs 20 euro per person in summer season and in off season it is 10 euro per person. St. Stefan is amazingly beautiful inside. The panoramic view of St. Stefan is surely one of the most memorable sights along Montenegro’s coast, photographed so many times that it is almost impossible to imagine a promotional brochure or video without its enchanting sight. This miniature island is dotted with stone houses and joined with the mainland by sand isthmus which the sea currents have built during the ages. It is an exclusive tourist resort visited by the rich and famous with each house serving as a separate luxurious apartment. At the beginning of the 19th century the “smallest town in the Adriatic” grew to 400 inhabitants but shortly afterwards it started to decay due to the demise of the sailing ships. When in 1954 the number of inhabitants fell to just 21 it was then decided to resettle them and turn the island into an apartment hotel. The first cove to the north of Sveti Stefan is the famous Miločer beach. This quaint inlet has the one-time residence of King Aleksandar, a nice 1934 villa in the style of local stone houses. It’s sides are sheltered by thick groves while the wooded park behind the villa was populated with tropical plants during the time it was king’s reserve. One rocky hill further beyond Miločer is the small Kraljičina plaža (“Queens Beach”) named after Aleksandar’s wife Marija who regularly enjoyed its 120 m of sand surrounded with cypress trees and olives. Guest who want to take the tour in the island can do that, and guests who don't want to enter in the town, can explore the Royal park Milocer. All the guests can stay on the beach in St. Stefan and enjoy that miraculous place. Restaurants out of the island are affordable, but the guests who want to take lunch inside St. Stefan can do that. Average price of the lunch per person is 50 euro. Our main goal was to introduce the customers from Kotor to Budva and St. Srefan on a relaxing way, and to enjoy it as much as they can. The tour starts and ends before the big traffic jam and tourist crowd. NOTE:guests who want to bring their luggage on the tour and finish the tour in Budva can easily do that. There is no luggage fee.